Apimac introduced Protect Files, a new file and folder encryption application. Protect Files 1.0 creates a password-locked encrypted space for files and folders on hard drives, external disks, or a USB drive. Once Protect Files creates an encrypted space, it shows up as a volume on your desktop. When the space is locked, its content is secure; unlock the space, and you can copy, move, and delete files. 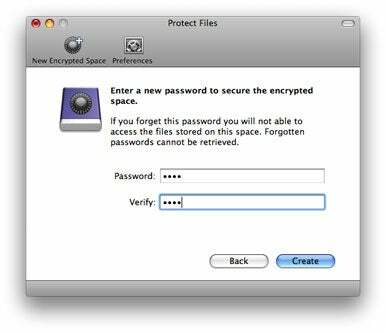 The secured space defaults to 128-bit AES encryption, but that can be changed to 256-bit AES in the application’s preferences. Apimac is offering Protect Files 1.0 for $15, with a trial version also available. The software runs on OS X 10.4 and later.